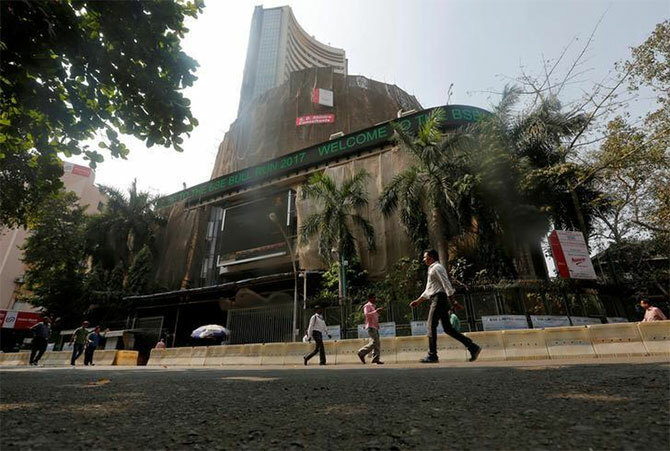 Snapping two-session long losing spree, the benchmark indices ended higher on Monday as investor sentiment got a boost after the government last week finalised rates for the upcoming goods and services tax (GST). The government on Friday unveiled four bands of rates under the GST for services in line with those applying to goods, a big departure from the current single rate of 15% applied on most services. The S&P BSE Sensex ended at 30,570, up 106 points, while the broader Nifty50 settled at 9,438, up 10 points. In the broader market, the S&P BSE Midcap and the S&P BSE Smallcap indices slipped in red to shed over 1% each. The market breadth, indicating the overall health of the market, was negative. On BSE, 1,837 shares fell and 887 shares rose. A total of 187 shares were unchanged. Nifty FMCG (up 3.6%) was the best performing sectoral index led by gains in United Spirits (up 7%), ITC (up 6%), Marico (up 2%), Britannia (up 1.6%), Jubilant FoodWorks and HUL (up 1.2%). ITC was the leading gainer on Sensex and Nifty both, and hit its new high of Rs 305 on the BSE. Renewable energy company Suzlon Energy surged as much as 8% to its highest since Jan 6, 2016 after the company posted a March quarter consolidated net profit compared with loss a year earlier. Motherson Sumi Systems (MSSL) hit a record high of Rs 441, up 4% on the BSE, extending its Friday’s 3.5% gain, after the company reported 12% year-on-year (YoY) growth in its consolidated net profit at Rs 475 crore for the quarter ended March 2017 quarter (Q4FY17). State Bank of India (SBI) was the top loser and shed over 4% to Rs 294 on the BSE. The largest public sector bank's net profit more than doubled to Rs 2,814.82 crore in the March quarter as its net NPAs or bad loans narrowed to 3.7% of total advances. VRL Logistics dipped 9% to Rs 305 after the company reported 30% year on year (YoY) drop in consolidated net profit at Rs 8.38 crore for the quarter ended March 2017 (Q4FY17). It had reported profit of Rs 11.93 crore in the same quarter year ago. European markets opened higher today. The pan-European Stoxx 600 edged up 0.12%, while Britain's FTSE 100 and France's CAC 40 added 0.3% and 0.1%, respectively. Overseas, Asian equities ended higher, following the continued recovery on Wall Street last week. Investors shrugged off a weekend missile test by North Korea that raised further concerns on its ability to deliver a nuclear warhead as far as the US states of Hawaii and Alaska. Japan's Nikkei rose 0.4%, Hong Kong's Hang Seng 0.8%, while China's Shanghai Composite bucked the trend to lose 0.4%.